You are here: Home / Special Occasions / Getting Married? Getting married is making a life-long commitment to a partner. Jesus Christ described himself as the groom to the Church as his bride. We celebrate marriage as the life-long union between a man and a woman under God as the most important human relationship we can enter into. 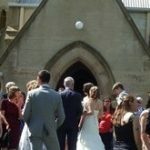 Whether it’s a small intimate family group or 400 of your closest friends and relatives we would love to to assist you to begin that journey in the best possible way and the Anglican marriage ceremony provides lots of scope for your individuality and personality to be expressed. We have a number of lovely churches that are regularly used for weddings. Need more information? Please contact one of our Ministers.